Bentley soon befriends Eirwyn, a mysterious but compassionate young woman who often distributes food among the poor. When Eirwyn is kidnapped by a ruthless tribe to serve as a sacrifice, Bentley battles a vicious mountain creature to save her life. But when he discovers who is really behind Holbrook's downfall, he's faced with an even bigger challenge - battling the Dark Knight's most evil commander and his Shadow Warriors as they attack the castle. About "Sir Bentley and Holbrook Court (#02 in The Knights Of Arrethtrae Series)"
“I do.” Young Bentley looked up at Kifus. Sand-colored hair formed loose curls around the young man’s neck and ears. His square, clean shaven jaw revealed a small, faint scar—a badge to remind him never to become prideful about his considerable abilities as a swordsman. Bentley’s shoulders were broad, and he carried himself with the distinctive posture of a nobleman. In spite of his comely appearance and his social charm, however, Bentley did not hold himself in high regard, and thus there was very little to dislike about the young man. Nearly all two hundred Noble Knights were present to witness the knighting of one more squire into their brotherhood. It was a time-honored tradition that often followed the family lines of the wealthiest men in Chessington, and such was the case with Bentley. Behind the Noble Knights stood two to three hundred highly respected citizens of Chessington, for this was a significant event for both the Noble Knights and the citizenry. What could be more honorable than service to the King? “I am proud of you, my son.” Barrington smiled broadly through his cropped salt-and-pepper beard. “Thank you, Father. You and you alone have been my inspiration.” York stepped forward and grasped Bentley’s arm. “Sir Bentley…has a nice ring to it, aye, laddie?” He slapped Bentley hard on the shoulder with a meaty palm. York squinted and cocked his head to one side. “Before the…ah…Followers?” Bentley added. It was an unusual question, and it conveyed much more than curiosity. Those few words carried a subtle message that raised the eyebrows of both York and his father. countenance had assumed a familiar ferocity, his eyes beneath their bushy black brows seemed to shoot forth fiery darts. ended when his mother took his arm and a dozen other knights and citizens moved in to offer congratulations. enjoy the moment. It felt good to be a Noble Knight…almost perfect. He tightened his grip and countered with a rising cut, followed by a horizontal slice. His sword was met by the nearly immovable dark blade of the warrior, and he had to retreat to avoid the next deadly slice. faced were much more than mere marauders; they had the look of seasoned war veterans. The Noble Knights had the advantage in numbers only, for the skill and power of these men far surpassed anything they had ever experienced. Bentley considered his next move. How could they have made such a serious miscalculation and come to such a desperate situation? The months following his knighting ceremony had been filled with raids on the Followers, but each week seemed more intense than the previous. This was already their third mission this week. Another powerful slice came terrifyingly close, and Bentley ducked. He heard the swoosh of his enemy’s blade pass just above his head. Bentley initiated another rising cut, but missed and found himself slightly off balance. He knew that such an experienced man of war would capitalize on Bentley’s mistake—and he did. The next slice came from Bentley’s left, and he was only able to raise his sword for partial protection before the grisly blade blasted through his defense. The concussion on his sword carried on to Bentley’s left spaulder and slammed into his helmet. Bentley careened to the right, scrambling in vain to keep his footing, then crashed to the ground. warrior’s blade burst through his resistance and into his breastplate. The impact of the blow on his body seemed to force the last of his strength from him. His end was near. engaged with a new adversary, one Bentley had never seen before. Bentley chanced a quick glance about him and realized that four other knights had joined their cause against these massive warriors of destruction. Another glance filled him with shock as he recognized their insignia. The newcomers bore the unmistakable mark of the Stranger. This was the enemy Bentley and his comrades had set out that morning to engage. Yet these men were fighting to save their lives. the remaining knights in vanquishing their foes. When the tips of the swords slowly settled to grassy harbors of rest, only one man had fallen. Bentley and anotherNoble Knight went to him and began removing his breastplate, for the wound was serious.The other men stood breathing heavily as the rush within their bodies subsided. The four Followers looked stunned, then slowly stepped back and away once they determined the burly knight was not bluffing. The other knights looked at one another and then at Bentley. Bentley met their eyes, then knelt back down to his fallen comrade.The delay allowed the Followers to separate themselves, and they ran into the trees of the valley. York’s eyes burned with fury, and in that moment Bentley fully discerned how deep York’s contention with the Followers lay. It was a moment that set his mind on a different course. Customer Reviews For "Sir Bentley and Holbrook Court (#02 in The Knights Of Arrethtrae Series)"
We've ended up buying the entire Knights of Arrethtrae series, they're that good. They're well written, with an extensive vocabulary and strong characters. They're the kind of stories that inspire you to step up and become the person God has called you to be. The story of Sir Bentley is one of a man who finds his life of wealth and stature unfulfilling, and becomes a knight of the Prince. He learns what life is like for the less fortunate in the kingdom and lays his own life on the line to set free a people who are enslaved to the enemy. 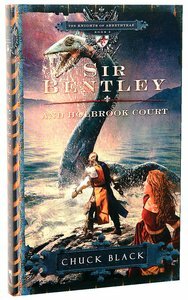 Sir Bentley and Holbrook Court, by Chuck Black, tells of a young knight named Sir Bentley. He rebels against the Noble Knights who oppose the Prince who came to die to save them. He flees away to find out if the Prince is the true Son of the King. He then comes into contact with some Knights of the Prince. He travels on with one of them to Holbrook Court where a greedy king lives in luxury while his subjects have hardly enough food to live. Does he find out the truth about the Prince? How will he save the people of Holbrook Court? I really like this book and recommend it to people who like suspense, bravery and intense battles. It shows Biblical teachings such as how Satan sends out workers to twist men's minds towards evil. This is a great book and in some ways even better than the first book in the series.